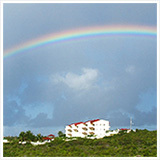 I've experienced a few different beaches of Anguilla, including the Anguilla beaches you recommend on your website. However, my favorite is Meads Bay. Although you have Malliouhana on one end, and Viceroy on the other, the whole mid-length is rarely scattered with people. I first grew to love Meads Bay when I stayed at Frangipani (great little resort right on the beach), and ever since then I've returned - even if I'm not staying anywhere near! I find the water to be the clearest, and there are no rocks, making the water easy to run into. Granted, snorkeling is not so much fun there because there is nothing to see (except the occasional little fishy); however, I got some great video of the pelicans and seagulls diving into the sea for their dinner. I think I will always return to Meads Bay. I hope it stays as pristine as it is forever. Nori's Reply: I am definitely with you, Jennifer. Meads Bay is one of Anguilla's greats! How was Frangipani? I have walked around the resort, eaten at Straw Hat many times, but never seen any of the rooms. They have a great spot! 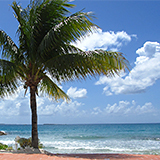 Meads Bay sure is spectacular, perfect for swimming and diving into waves, too. They can get pretty big on that shoreline! Comments for Meads Bay Is For Me!